A broken business model? Photo by MattHurst on Flickr. BlackBerry announced its fiscal fourth-quarter results on Friday, covering the period over December 2014 to the end of February 2015, and they were pretty woeful. Revenues came in at $660m, way below what analysts were expecting, and the company made an operating loss of $106m ($50m of which was adjustment for the potential value of the $1.25bn cash injection it got from a debenture issue). It managed to squeak a net profit, helped by $115m gained from selling its share in the Rockstar patent consortium. I’m continually fascinated by BlackBerry, because it’s a company struggling to turn itself from one thing (a business that sells handsets and takes an ongoing fee from handling data for them) to another (a company that makes its money from software licensing from managing handsets in businesses). 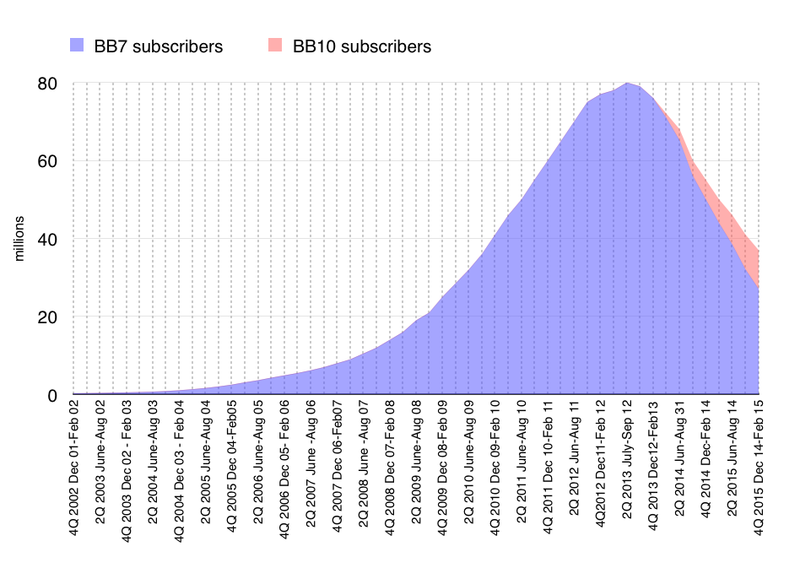 So both BB10 and BB7 users are “subscribers”, but only the BB7 ones generate SAF revenue. Now consider this: BlackBerry isn’t gaining any new consumer subscribers. It’s losing them hand over fist, though it might be hanging on to some business users. BlackBerry is very coy about its subscriber count and how many BB10 handsets have reached end users, not mentioning them in its earnings releases, and squirrelling them away in its financial documents. But they can be unearthed if you’re determined enough. (I am.) Here’s the latest subscriber number, on p106 of the 40F, which was released some time after the financial results on Friday. Detail from BlackBerry’s 40F report for the latest year: it says it has 37m subscribers. The peak – 80m – occurred before the release of BB10. At the end of February 2015, the subscriber count was 37m. The total number of handsets that reached customers (“sell-through”) in the past eight quarters since BB10 was launched two years (eight quarters) ago is 26.2m. Digging back reveals how many BB10 handsets have actually shipped to end users – surely replacing existing BB7 handsets: just 10.1m. BB7 handsets have been substantial for some time. • this suggests that 70% of BlackBerry subscriber handsets now in use were bought in the past two years. • isn’t it amazing that BB10, the platform that was going to be BlackBerry’s salvation, has only sold two-thirds as many handsets as the platform it was supposedly making redundant two years ago. It’s as if the iPhone 4S were running iOS 6 and radically outselling the iPhone 6, or the Galaxy S3 were outselling the Galaxy S5. But – imagine – what if every handset sold since the introduction of BB10 had been a BB10 handset? That would mean 26.2m BB10 handsets, so only 37m-26.2m = 10.8m BB7 handsets in use. In the just-gone quarter they would have generated $11.49 x 10.8m = $124.1m in service revenue – a drop of $184.9m in service revenue. Yow! Then again, think of all the hardware revenue! Surely that would more than make up for it? Yes, it would – ah, but for one detail: SAF is crazy profitable, and it’s profitable during the lifetime of the handset. This has big implications. Companies want to be profitable, and want to be profitable for a long time – not just one-offs from handset sales. Services are super-profitable for BlackBerry because it has the infrastructure for it, and can easily handle the data volumes involved (it used to handle it for twice as many devices, after all). Another little detail I found in the financials is that in the fiscal year to end Feb 2015, services and software brought in revenues of $1,854m – but the cost of sales (ie how much it cost to do) was just $287m. Hardware slumps towards loss while services and software coin it. Even if you treat software revenues as pure 100% profit, the services gross margin still comes out as 82%, even in a “bad” year. Even if you assume software is 100% profitable, services come in with a margin of 82% or so. So in our scenario where BlackBerry has lost $184.9m in service revenue (because all the handsets it sold were BB10), that means it has forgone $151.6m in gross margin profit in a single quarter. At a time when it’s struggling to show any profit (remember, it recorded an operating loss, because of things like R+D and marketing), that’s bad. What price do handsets need to sell for to make up for that? Let’s first find out how much we need to collect. Take the $11.49 per-handset SAF revenue from the latest quarter: at 82% margin, that yields $9.42 in gross margin profit per BB7 handset per quarter. We saw above that 70% of handsets were replaced over two years; logically all 100% should refresh over three years. So SAF revenue yields profit for, let’s say, 12 quarters. Even at the low SAF revenues we’re seeing, if you take that as read, then over 12 quarters (at per-quarter $11.49 revenue, $9.42 gross margin) services yields a per-handset gross margin profit of $9.42 x 12 = $113.04 over a BB7 handset’s life..
How does hardware compare? Well, for BB10 hardware to be worth it for BlackBerry, it has to generate as much, or more, gross profit over three years. At 4% gross margin, that means BB10 handsets would have to sell at an average price of $113.04/0.04 = $2,826. Yes, nearly three thousand dollars. Even at 20% margin, it would need a handset that it sells to carriers for $565.20. That’s iPhone-style pricing. They’re nowhere near that. Yeah, I know, the BlackBerry fans will tell me that the BB10 Classic is going to sell like crazy, because it looks like a BB7 handset, and that carriers are all behind the company, and so on. Look though at the price of the Classic: $449. At 10% gross margin (and taking the retail price as what BlackBerry gets, which it isn’t), that’s a hardware gross profit of $44.90 (and a service profit of $0). At 20% (which it won’t make at the tiny scale it operates on), the one-off hardware profit is $89.80. On its current SAF, BlackBerry gets more profit from a BB7 handset in three quarters than a BB10 handset at 10% margin; or six quarters at 20% margin. 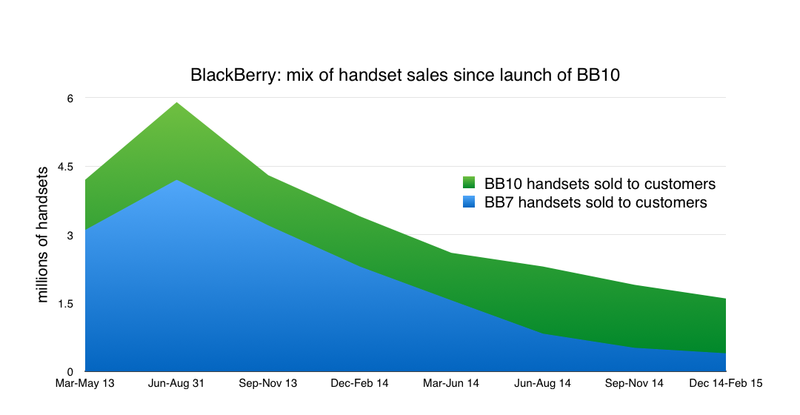 You might argue that BB7 handsets lose money at sale while BB10 ones make it. The numbers don’t say that, though. BlackBerry’s numbers have all trended down ever since the launch of BB10, and its accounts are littered with writedowns on inventory. In short? 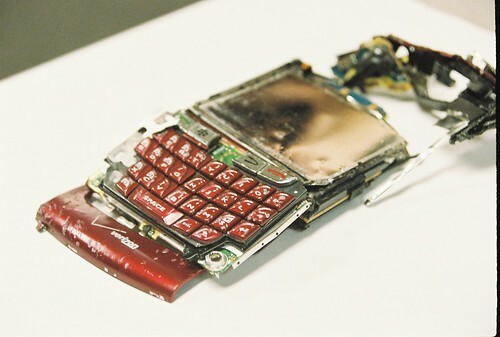 John Chen is pretty fortunate that BB10 handsets don’t sell that well, because they’d tear down the already faltering finances of the company. It actually makes better financial sense to keep selling BB7 handsets. The immediate handset profit is lousy, but the recurring revenues are great. Q: So maybe give us a quarterly total and somewhat of a split between while under the EZ PASS program and after the EZ PASS program? John Chen – Chief Executive Officer: First of all after the — the EZ PASS program ended at 6.8 million licenses, no, I don’t have that number with me and I will have to look at some metrics. Uh-huh. I bet if the numbers had been good, he’d have made sure that they were right there at his side. The fact he couldn’t offer anything didn’t sound good to me. Still, it could have been worse. He could have had to tell people that they’d only sold BB10 handsets. This entry was posted in journalism and tagged blackberry, financial by charlesarthur. Bookmark the permalink.